WHEN Shinzo Abe resigned after just a year as prime minister, in September 2007, he was derided by voters, broken by chronic illness, and dogged by the ineptitude that has been the bane of so many recent Japanese leaders. Today, not yet five months into his second term, Mr Abe seems to be a new man. 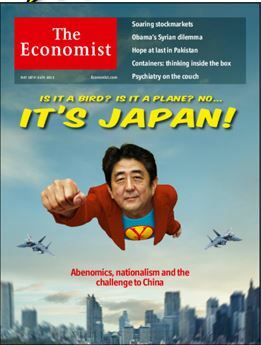 He has put Japan on a regime of “Abenomics”, a mix of reflation, government spending and a growth strategy designed to jolt the economy out of the suspended animation that has gripped it for more than two decades. He has supercharged Japan’s once-fearsome bureaucracy to make government vigorous again. And, with his own health revived, he has sketched out a programme of geopolitical rebranding and constitutional change that is meant to return Japan to what Mr Abe thinks is its rightful place as a world power.